Lots of divers seem to be getting back in the water after many years. This is great news for diving in Cape Town. So this sunday we are doing lots of Refresher courses. 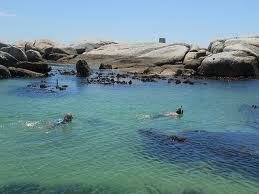 False Bay coastline offers some superb, varied and beautiful dive sites. The majority are shore entry and some are by boat. You will see stunning reefs with rocky terrain and amazing Kelp forests. You will never see a bare rock or reef, as every nook and cranny on the reefs are carpeted by sea anemonies of every colour imaginable and a large variety of sponges, soft corals and marine life. Diving through the Kelp Forests is awesome and so beautiful. Every dive you will be amazed with the colours and the variety of Marine life, diving with the cow sharks is breath taking. Every dive in Cape Town is a winner.